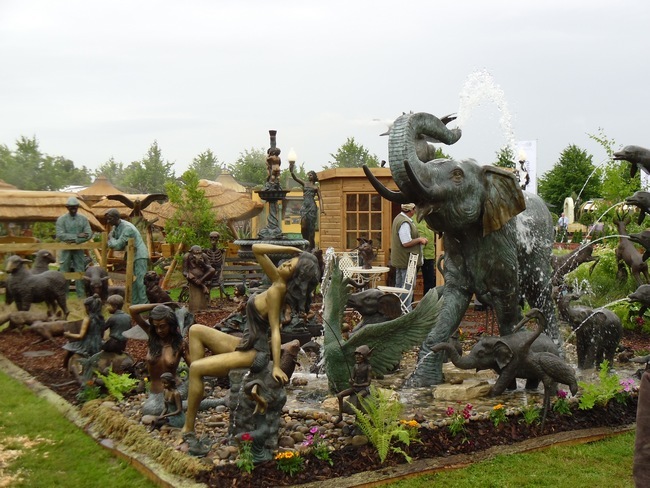 If there is one event that you need the weather to be dry for it is a garden show, when you will be outside, exposed to the elements. In between the heavy showers and lighter grey skies at the RHS Hampton Court Palace Flower Show there was a real buzz of excitement and anticipation as to what new features were going to be on display in the gardens and marquees. The Grapevine Theatre sponsored by Anglian was a must stop for people wanting to see a live TV show with a studio experience (and escape the rain!). 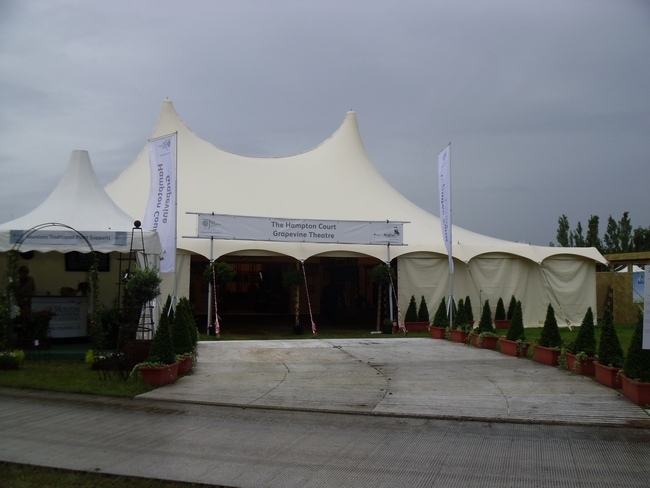 David Domoney, TV garden expert and his team of celebrity guests which included John Craven, Bill Oddie, Adam Henson and Toby Buckland kept the audience entertained with their own stories and experiences in the theatre style marquee each day. 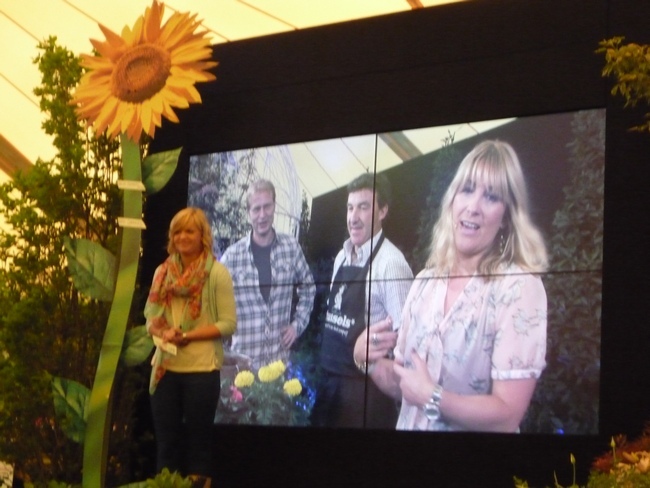 Some of the items covered on the magazine style TV show were plant care and gardening tips, insight into the designs of other show gardens, products around the show ground and other marquees. 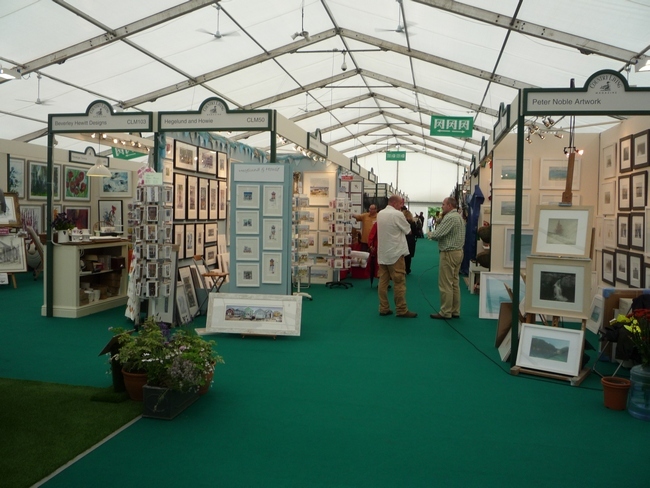 Martin, the ‘roving reporter’, visited other stands near to the Grapevine marquee with the TV pictures being beamed back into the theatre studio. The audience watched the Hanging Basket Challenge with great interest: the celebrity guest had to fill a hanging basket with plants in the quickest possible time. Their time was recorded and added to the stem of the flower next to one of the large screens at the side of the stage to keep a track of the fastest planter. This brought much laughter from the audience at the hap-hazard way the plants were put into the basket, with some looking a little worse for wear after the event. Guests venturing in to the Grapevine marquee during the Hampton Court Flower Show Gala evening on Monday could not help tapping their feet and dancing as they were entertained to the musical sounds of The Satellites band, who played songs from the 70’s and 80’s up to the present day. The evening was drawn to a conclusion with the spectacular firework display over Hampton Court Palace, this was watched in the rain by many, but no spirits were dampened. On the first day opened to the public, visitors were keen to see what was new and inspiring that could be translated into their own gardens, whether it was plants, unique coloured flowers or old plants that had been modified through growing techniques to improve life span and protect them against pests and disease. – vertical planting, this is where walls are heavily planted in panels on full or part walls. – mixed plant heights in a flower beds, giving the flowerbed depth and colour to the area, using a number of colours. A great example of vertical planting was on one of my favourite gardens in the “low cost, high impact” garden area called “live outdoors” designed by Roger Smith. This 4 x 4 metre garden was designed and built with a budget of £13,000. The idea behind it was to show how you could achieve an outdoor living space with privacy in an urban environment. The back wall above the open, wood fired oven, showed a perfect example of vertical planting with the horizontal beams on the pergola also carrying channels to hold the trailing plants, which added to the privacy of the seating area if viewed from above. 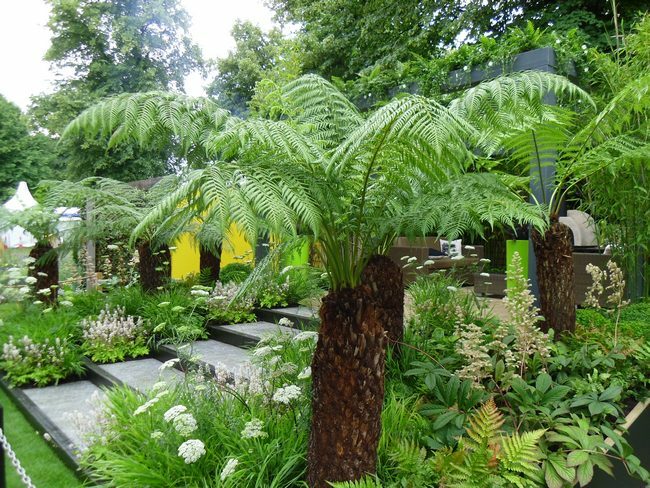 The tree ferns at the end of the garden added to the tropical and relaxing feel, drawing the eye at low level into the garden, give coverage to walls in a small area and not blocking out the light from above. The garden received a Silver-Gilt award. The awards for show gardens come in four grades, RHS Gold, Silver-Gilt, Silver and Bronze medals and are judged according to a set criteria. 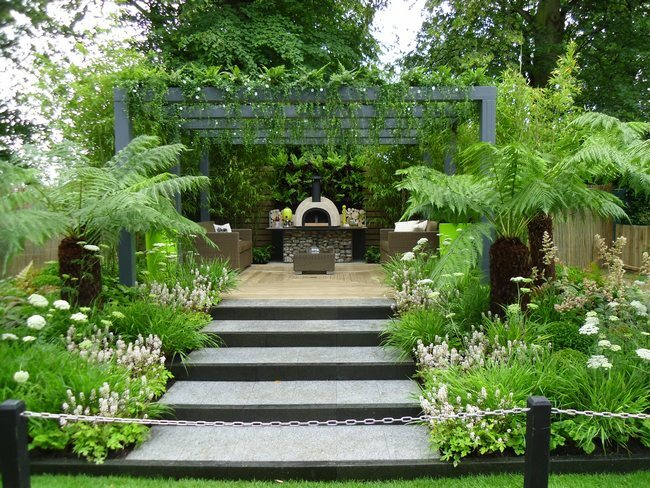 Another of my favourite gardens was in the Show Gardens category called “The Italian Job” by young garden designer Jack Dunckley. The garden is built on a much larger plot with a much bigger budget. The garden for me had a very calming effect, it enticed you to wander through the garden and end up under the pergola to relax and enjoy the surroundings. Some people like to have water in their garden, whether it be still or running and the thought of a hot day just sitting on the edge of the decking with your feet dipping in the cool water was a huge attraction for me. 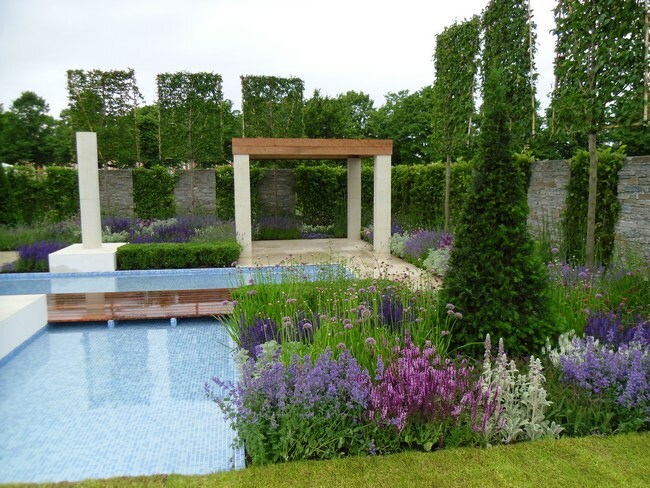 The flower beds were planted in blocks of purples, pinks and silvers and added to the cooling feel of the area and soften the harder landscaping. 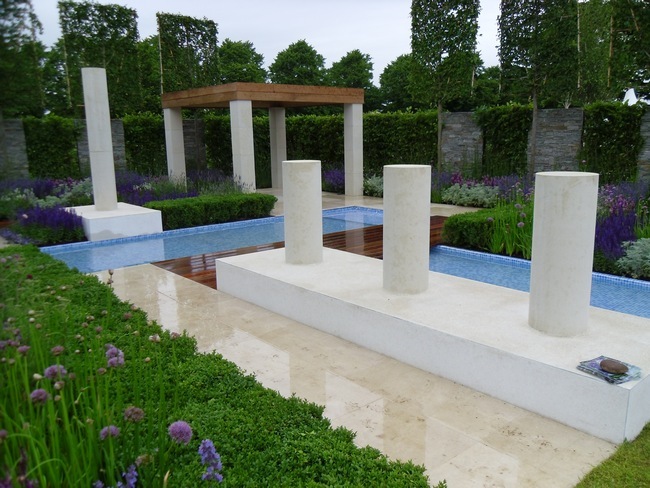 The natural limestone pillars and paving add structure to the garden and took my memories back to visiting the Acropolis in Athens many years ago and that of the Monaco Garden at the Chelsea Flower Show in 2011, although the planting and garden colours were very different. I tried to think what the similarities were and on reflection it came down to the blue pools the teak decking and the light stone paving. This garden received a Silver-Gilt award. If you were not content with just looking at the show gardens there were many other areas to view, these included the Floral Marquee, the Rose and Floristry Marquee, the Plant Heritage Marquee, the Growing for Taste Marquee, the Great Taste and Artisan Food Marquee and plenty of things to buy including garden ornaments, furniture, trinkets, clothes practical gardening tools, you name it, it was there for every gardener’s whim. Every possible animal you can think of an more! 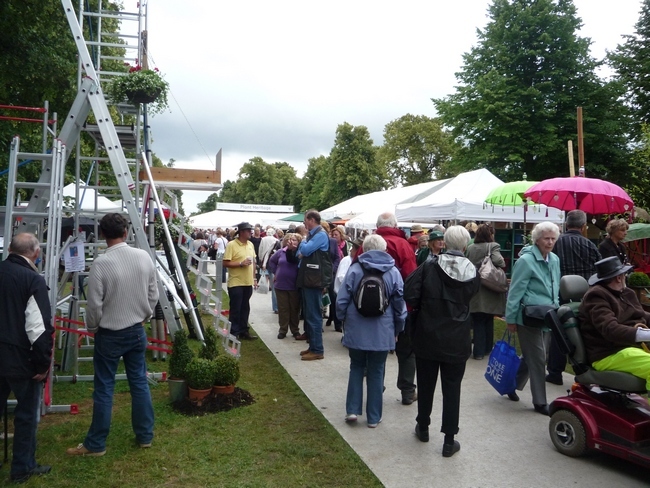 Some would ask why you need a ladder at a garden show, but how else will you reach the top of your hedge or tree to trim?